Keep Calm and Sparkle On! (The Wish List #2) (Hardcover) | Let's Play Books! Isabelle has finally made it to Level Two of Fairy Godmother Training -- but just barely. She'll really have to step it up if she wants to pass the next challenge. Level Two of training comes with a twist, however. Isabelle's newest practice princess isn't who she expected -- and granting the new girl's wish means making her old princess, Nora, really unhappy. What's a godmother to do? 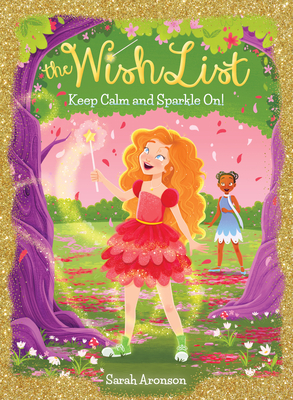 Isabelle will need more than a few magic sparkles to make everyone happily ever after this time! Sarah Aronson has always believed in magic—especially when it comes to writing. Her favorite things (in no particular order) include all kinds of snacks (especially chocolate), sparkly accessories, biking along Lake Michigan, and reading all kinds of stories—just not the fine print! Sarah holds an MFA in Writing for Children and Young Adults from Vermont College of Fine Arts. She lives with her family in Evanston, Illinois. Find out more at www.saraharonson.com.